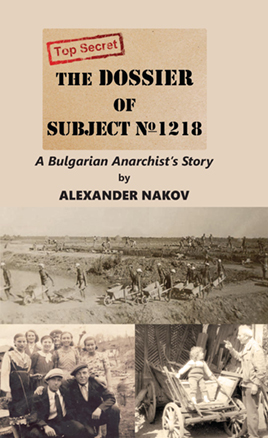 The following book is the autobiography of the 97 year old revolutionary anarchist communist in Bulgaria, Alexander Nakov. This first English translation was edited and contributed to by former AF members now associated with this Communist Anarchism blog. Of the few who managed to survive the horrors of Bulgaria’s Stalinist concentration camps, Alexander Nakov is possibly the most representative of the older generation of active and committed anarchists. Initially reluctant to write his memoirs, Alexander was eventually persuaded by friends that his story needed to be told. And by telling that story, he now remains a vital link between the anarchist militants of the past and the youth of today. In clear and concise prose, Alexander details his youthful activity, his subsequent imprisonment and his fierce resistance to an inhuman system. Translated from the Bulgarian original by Mariya Radeva, edited by Rob Blow, foreword by Nick Heath. 178 pp., index; 5 colour plates; 29 in-text graphics; 213x134x13mm, 245 g.
If overseas, drop us a line for any extra postage costs. A short biography of the Bulgarian anarchist guerilla Tinko Simov.